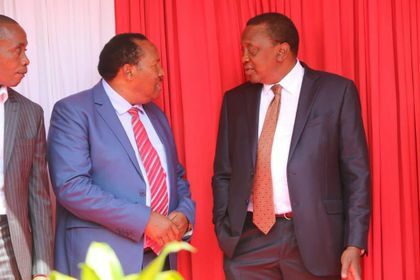 Monday March 4, 2019-President Uhuru Kenyatta has castigated Kiambu Governor, Ferdinand Waititu, for telling him to go slow on the ongoing corruption purge. Speaking on Thursday in Muranga during the burial of prominent Muranga businessman, Thayu Kamau, Waititu urged Uhuru to go slow since “our people are in Rift Valley” and might be targeted. Waititu ,who jokingly publicly announced that he had ditched the Tanga Tanga movement and conveyed the condolence message of Deputy President William Ruto at the funeral, urged the government to stop targeting a particular tribe in the ongoing war on graft. “Even as we support the war against the graft, we should remember that our people are in Rift Valley and I request that we approach this war together as a team just the way we joined hands in 2013 with our brothers in Rift Valley,” Waititu said. When he rose to speak, Uhuru who also attended the burial, did not respond to Waititu claims but when he finished he summoned Waititu and scolded him for making such silly remarks. “We were waiting for the body of the deceased to be mounted in the hearse just outside the tent when the President scolded Mr Waititu and told him off, accusing him of playing dirty petty politics. He was very furious and the governor did not respond," said an MP who was close to the Governor. Vampire, the truth is all there. You can frame the dp in crimes of your satanic regime in hiding your looting, which your tribesmen/women can't tell you on the face. You only have a legacy of projects that only benefit you and your family empire. Please, don't soil the dp, cos, all the looting in your stolen regimes is all looting and pretending you are clean and holy than holy, yet you are not by Lucifer standard, cos, God standard, you are equal to satan. the handshake is between you are your crime vampire brother in crime in trying to cover your looting and introduction a mp post to have you in office in continuing with you looting and protecting those loots.